This extension helps you to perform Magento 2 checkout customization by adding extra fields of various types. Gather comprehensive order data in a convenient way both for customers and admins. Smoothly manage info in custom input forms using the order grid. Feel free to create as many different attributes as you need – find your ideal combination. For example, let customers leave comments to orders in the text field or let them quickly specify their demographics by marking checkboxes. To gently get maximum information, you can parcel out your custom input forms to checkout steps and ask for data with regard to the process stage (such as shipping, payment, or reviews). Following a holistic approach, this module combines features aimed at customers and admins alike. You can decide which fields to add to the checkout page taking into account customers’ data and their assignment to particular customer groups or store views. For example, you can display an order attribute related to a particular shipping method and this way enable only the customers that choose self-delivery to leave comments in the text area. Save data in certain custom fields, such as name, country, or preferred shipping method, to cut the time required to complete future purchases. Also, you can apply default values to empty input forms (if they are not obligatory) to let customers choose whether to submit information or not. 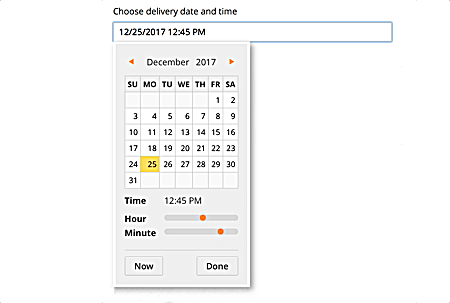 This calendar will make it quick and easy for customers to pick the delivery date. Create dependencies between custom checkout fields and this way maintain a concise and transparent appearance of the checkout page. A dependent order attribute will appear on the screen only after a user picks a particular value of the parent attribute. Complement custom fields with tooltips that will clarify what each attribute stands for and why you need such data. Be honest and precise, and customers will trust you with more information if they feel that this is a win-win deal. Accuracy brings trust. You can add custom fields to the HTML documents which customers can access via their account pages, include them in PDFs (invoices or shipment details) and order emails (booking or payment confirmation). This extension makes order confirmation more handy for admins. Now you can create an order from the admin panel and, if necessary, change the custom fields values after an order is submitted by a customer. If an input form is left empty, you can apply a default value even if this attribute is visible only to admins. Provide a calendar to make the editing process even more user-friendly. You can use order grid to view, filter, and edit your custom input forms. While the checkout page becomes more advanced and informative, its management is getting just easier. The Checkout Fields module allows adding attributes via API. This way, you can integrate your webstore with a loyalty management system, CRM, ERP, or other software and automatically update information in them right after customers submit it on the checkout page. Do you have a big team managing the Magento 2 store? Take full control over orders data and empower only particular admins to edit values of custom fields. No data loss, no mess. Order processing works as you expect. I had a new strategy and needed addon for its realization. Used this plugin and gathered all the extra order data we had to have for its realization. As a result, we launched it and gained more sales. What surprised me even more is that the technical team works really fast, responded to my ticket in 2h - great reaction. We have several retail points in addition to an online shop. As this extension supports API integration of attributes it is much easier for us to work with orders and inventory. After we established integration, data flows to erp without additional checks. My team was happy with this convenient bonus. I also use One step checkout. Unfortunately, in the beginning they didnt work well together. Custom fields, which I added in this module, didn’t work properly in one step checkout. Amasty support was very helpful, they checked the problem immediately and solved it in a day or so. Now its ok.
We added several custom fields but distributed them among checkout steps. Our internal tests showed that though we increased the number of required fields, customers don’t think that checkout is now more complicated. Result: we get more data with the same user convenience. Tks! I had problems with installation but support managers helped me to solve it fast and fixed the problem. Otherwise, everything works well and doesn’t lead to conflicts with other modules. Good module. Many features for convenience. Dependent fields and group-related fields help to customize checkout and stay relevant to clients. With module I customized all checkout fields and added inputs I needed, thanks. I installed this module to my clients. The functionality is quite good for such kind of extns. Also it is well coded and has some things that developers will like. For example, you can use an order model object to get data from custom order fields. So, recommended. I purchased the installation and didn't get at once what are the next steps. Though, I got everything included into the service in a short time and now my checkout looks what I intended it to be. I had problems with attributes display on the checkout shipping step but the guys fixed it in four days. And thought there are still places to work, the plugin works fine. – New: introducing a new type of order attribute - HTML type. For example, it can be used for attaching a link for tracking a shipment. – New: now it is possible not to display an attribute on the checkout page. But it will be still available on the order details page in customer's account. – Improvement: the installation process of the extension was improved and uses less memory now. – New: we completely renovated the technical side of the Order Attributes extension. This deep code refactoring makes the module significantly more stable and increases its performance. – Allows creating dependent attributes, i.e. to display certain attributes only when a particular value of a parent attribute is selected. – Compatibility fixes with the Amasty Customer Attributes and Amasty Order Grid extensions. – Improved work with e-mail templates. – Fixed errors in a customer account. – Possibility to get order attributes data using an order model object (useful for developers). – Possibility to read/update/set order attributes via Magento API. – Fix for a default value in the checkbox input type. – Fix for printing Invoice and Shipment documents. – New rule added to validate text field input length. – Compatibility with the Customer Attributes extension. – Fix for displaying filters on order grid, shipment grid and invoice grid. – Fix for displaying attributes on a shipping step of checkout when a customer is logged in. – Fix for displaying attributes in an e-mail message after placing order for the first time.